We read with great expectations, the cross-sectional study published in a recent issue of your esteemed journal addressing the clinic-dermoscopic features of melasma in 100 Indian patients published by Nanjundaswamy et al. However, it is imperative to highlight certain crucial aspects regarding the approach to Pigmentaroscopy relevant to this study, to apprise the readers regarding the dermoscopy of melasma. First, the study states certain mutually contradictory statements in its introduction section; for example, the conventional concept of subdividing melasma into epidermal, dermal, and mixed type, floated more than 30 years ago by Sanchez et al. has been rendered redundant with recent in-vivo reflectance confocal microscopic findings that demonstrated the heterogenous distribution of melanophages between different regions of the melasma lesion and within a particular region of a melasma lesion. These findings have clearly confirmed the absence of true epidermal/dermal melasma; rather, all melasma is in essence now considered mixed., In methodology, hand lens examination of lesions was undertaken to classify the lesional distribution as well as level of depth. To the best of our understanding, a hand lens examination cannot suggest the depth of melasma or any hyperpigmented lesion. And although the color and hue of the pigmented areas observed by the naked or hand lens-aided eyes may roughly suggest the approximate depth of pigment deposits, the difficulty of such appreciation in Indian population and ethnic skin is well known. The description of the study methodology could have been a little less verbose and more adept. The pertinent aspects of history that have important bearing over the pathophysiology and clinical presentation of melasma such as sun-exposure, duration of onset, association with pregnancy, history of contraceptive pills, family history, seasonal variation among others should be detailed. Although as per the stated study exclusion criteria, patients on any treatment in the past 3 months were not to be included, authors state that of the 100 patients included, 14 had been applying topical corticosteroids (potency and duration not mentioned). Further, 22 patients were applying “daily cream” (unclassified), and no history is mentioned about sun-screen use. The dermoscopic features of treatment-naïve as well as 14 steroid-treated patients were analyzed together. Thus, in the absence of treatment details (primarily, when was the topical corticosteroid or other unclassified treatments stopped), inclusion of 36 patients with the history of application of topical corticosteroid or unclassified cream seems contradictory to the study exclusion criteria. The authors further used dermoscopy to classify melasma into “epidermal,” “dermal,” and “mixed” based on the criteria suggested in the studies of Manjunath et al. and Tamler et al., addressing the detection of melasma depth by correlating dermoscopic findings with Wood’s lamp examination findings. Wood’s light has been shown to have low accuracy in the prediction of melasma depth compared with histopathological evaluation. In fact, Manjunath et al., the authors of one of the studies that have been the standard reference for the current study, have themselves openly lamented about the unreliability of Wood’s lamp examination, especially in darker skin types like that of Indians in their paper. Even as per the results of the other base-study of Tamler et al., the statistical agreement between dermoscopy and Wood’s light examination was 44, 57, and 51% in epidermal, dermal, and mixed melasma, respectively, conclusion being a weak degree of concordance between the two methods. 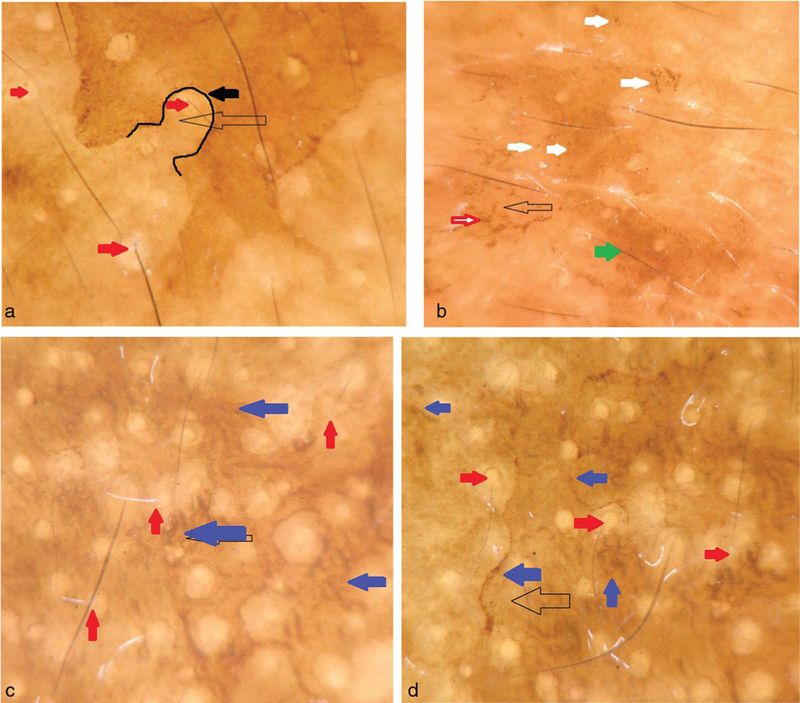 In this study, the scattered islands of brown reticular network with dark fine granules scattered on surface have been classified as epidermal, uniform skin involvement with no areas of sparing with dark brown to grey hyperpigmented lesions as dermal, and overlap features as mixed melasma, respectively. To the best of our knowledge, there is no such credible or evidence-based dermoscopic classification of melasma or any facial melanosis. Perifollicular sparing, one of the most important parameters that differentiates melasma from exogenous ochronosis (EO),, has not been commented on by the authors which would have been very informative to the readers. Proper cleansing of dermoscope prior to examination is necessary as images in study show plenty of artefacts (environmental particles, cream residue). Further, the dermoscopic magnification and mode (polarization) should always be mentioned, especially in a dermoscopy-based study. There is contradiction in what is stated in the text and figure legends and what is visible in the images. Figure 4 of the study, supposedly displaying a “classical” image of dermal melasma, has been described by the authors as “no areas of sparing with dark brown to grey hyperpigmented lesions with reticuloglobular pattern, telangiectasia and archiform structures.” The image actually shows dermoscopic artefacts, light-to-dark brown nonuniform background with dark brown clods and blotches, sparing of perifollicular region, patchy erythema (instead of telangiectasia), and no clearly discernible arciform structures [Figure 1]. It is also important to mention that the generic term to describe a dermoscopic feature is “structure” and not “lesion.” The light-dark brown background is as distinctly appreciable in Figure 5 apparently of “mixed” melasma, which additionally displays perifollicular sparing, brown clods and blotches, and few arciform structures, in addition to artefacts. It is a little surprising that the authors diagnosed and labeled seven patients out of 100 patients with EO that was not based on the classical interpretation of dermoscopic structures (vide infra), and in the absence of any supportive history or histopathological confirmation. Although EO is considered to be an underestimated and underdiagnosed condition, its reported incidence in India is limited to less than 10 cases till date, since the first case reported from Maharashtra by Zawar and Mhaskar in 2004. The so-called characteristic dermoscopic images of EO shown by the authors in Figures 6a–d are not suggestive of EO. While Figure 6a represents a solar lentigo (in a background of melasma with perifollicular sparing) with a characteristic moth-eaten edge, Figures 6b–d show brown colored dots and granules forming small clusters, and annular to arciform pigmented structures, which are commonly encountered in melasma itself. The features visible in these images with their appropriate description can be appreciated in [Figure 2]. Last, despite having reported 20 patients with atrophy (spontaneous) and 35 patients with telangiectasia (with additional confounding of whether steroid was used or not in some of them), no dermoscopic image has been shown for the same. 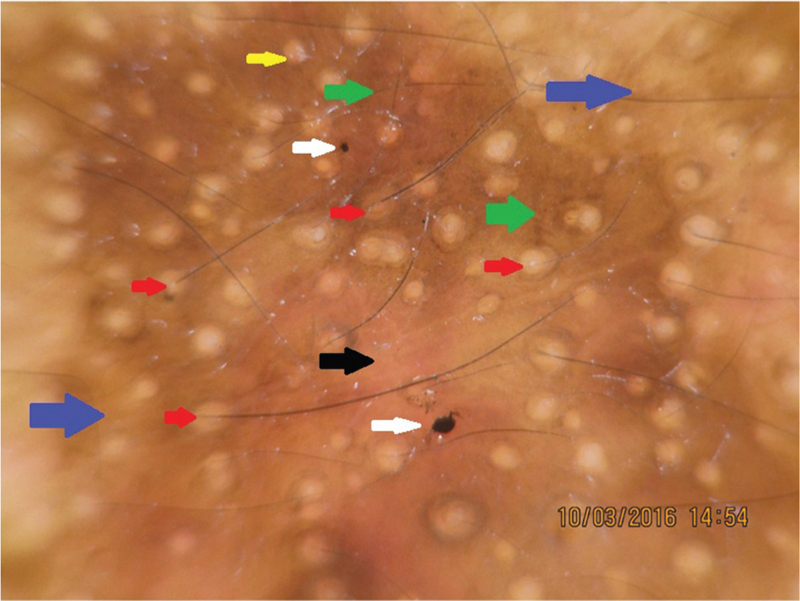 The technique of dermoscopy, interpretation of dermoscopic images, and use of proper terminology for the observed features, and designing and authoring a dermoscopy-based clinical study mandate a systematic approach, which were lacking in this study. In conclusion, while we laud the authors for initiating research in a relatively untapped territory of dermoscopy in Indians, extreme caution is warranted in the interpretation of the results and conclusions drawn from this study. Nanjundaswamy BL, Joseph JM, Raghavendra KR. A clinico dermoscopic study of melasma in a tertiary care center. Pigment Int 2017;4:98-103. Sanchez NP, Pathak MA, Sato S, Fitzpatrick TB, Sanchez JL, Mihm MC Jr. Melasma: A clinical, light microscopic, ultrastructural, and immunofluorescence study. J Am Acad Dermatol 1981;4:698-710. Kang HY, Bahadoran P, Suzuki I, Zugaj D, Khemis A, Passeron T et al. In vivo reflectance confocal microscopy detects pigmentary changes in melasma at a cellular level resolution. Exp Dermatol 2010;19:e228-33. Sonthalia S, Sarkar R. Etiopathogenesis of melasma. Pigment Int 2015;2:21-7. Manjunath KG, Kiran C, Sonakshi S, Ashwini N, Agrawal R. Comparative study of Wood’s lamp and dermoscopic features of melasma. J Evid Based Med Health 2015;2:9012-5. Tamler C, Fonseca RM, Pereira FB, Barcauí CP. Classification of melasma by dermoscopy: Comparative study with Wood’s lamp. Surg Cosmet Dermatol 2009;1:115-9. Ponzio HA, Cruz MF. Acurácia do exame sob a lâmpada de Wood na classificação dos cloasmas. An Bras Dermatol 1993;68:325-8. Sonthalia S, Jha AK, Langar S. Dermoscopy of melasma. Indian Dermatol Online J 2017;8:525-6. Jha AK, Sonthalia S, Lallas A. Image gallery: Dermoscopy as an auxiliary tool in exogenous ochronosis. Br J Dermatol 2017;177:e28. Zawar VP, Mhaskar ST. Exogenous ochronosis following hydroquinone for melasma. J Cosmet Dermatol 2004;3:234-6.